Why do people gamble? A large body of research suggests that cognitive distortions play an important role in pathological gambling. Many of these distortions are specific cases of a more general misperception of randomness, specifically of an illusory perception of patterns in random sequences. In this article, we provide further evidence for the assumption that gamblers are particularly prone to perceiving illusory patterns. In particular, we compared habitual gamblers to a matched sample of community members with regard to how much they exhibit the choice anomaly ‘probability matching’. Probability matching describes the tendency to match response proportions to outcome probabilities when predicting binary outcomes. It leads to a lower expected accuracy than the maximizing strategy of predicting the most likely event on each trial. Previous research has shown that an illusory perception of patterns in random sequences fuels probability matching. So does impulsivity, which is also reported to be higher in gamblers. 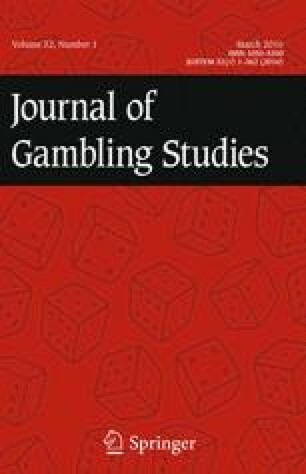 We therefore hypothesized that gamblers will exhibit more probability matching than non-gamblers, which was confirmed in a controlled laboratory experiment. Additionally, gamblers scored much lower than community members on the cognitive reflection task, which indicates higher impulsivity. This difference could account for the difference in probability matching between the samples. These results suggest that gamblers are more willing to bet impulsively on perceived illusory patterns. We thank the members of the Evolution and Cognition Lab at Clarkson University for their help in data collection, Dominique Schmidt for programming the experiment, and the executive director of the St. Regis Mohawk Tribal Gaming Commission Todd Papineau for his support. The research was supported by grants from the National Center for Responsible Gaming and the T. Urling and Mabel Walker Research Fellowship Program of Northern New York that were awarded to the second author.